The EDA system is ideal for the evaluation and diagnosis of the insulation condition in electrical rotary machines such as motors, generators, alternators, etc. Its main function is to analyse the condition of the stator winding insulation, using DC voltage levels without risk to the element under test. - For initial reception and quality control of rotary machines (generators, alternators, LV and MV motors). Forming a part of a maintenance program on rotary machines, where a non-programmed failure would represent a high costs, risks and installation outage, and of course, to verify failures. - To create a historial of the motors, etc. tested as the EDA system generates a report. In this report all technical data of previous tests are presented in a structured manner to easy follow the history of the element tested. - DC and 1 kHz Capacitance. - Ratio of DC and 1 kHz capacitances. - Insulation resistance (corrected to 20º and 40ºC). - Standardised leakage intensity (voltage and capacitance). - Leakage current ratio at each test voltage. - Re-absorption current standardised for insulation thickness. 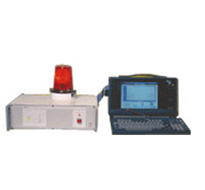 Also provided is a graphic display of the charge and discharge currents for each test voltage. Additionally a "standard" curve is displayed to easily determine departures from the linear insulation behaviour versus the voltage increase. A curve is displayed during the polarisation index test.